At the end of December 2016, I completed Japanese Beginner 4 at Iloha Culture Centre. I was struggling to understand the lessons during Beginner 3 but somehow found it easier during Beginner 4, Maybe I was finally finding my groove. I always dreaded the last class because that’s when we’d be given an oral and written test and I didn’t do too well in Beginner 3 as I only managed to score 73% which I thought was pretty dismal. For the written part of the test, I find that I have to really concentrate otherwise I will miss some characters and points will be deducted. I’d rather speak than write so I have little problem during the Q & A session for the oral part of the test. In fact, I rather enjoy the oral part of the test because the questions have already been given to us the week before and all we have to do is memorise the list. Compared to the previous tests, I found the Beginner 4 written test much more smooth sailing. I just told myself to be careful to write every single character because for the previous tests, I had marks deducted for missing characters. I didn’t think I had done that well but I was relieved I had completed all the Beginner levels which was my New Year’s resolution for 2016. A few weeks after the last class, I went to Iloha Culture Centre to collect the test paper and certificate and was taken aback when I saw the score. 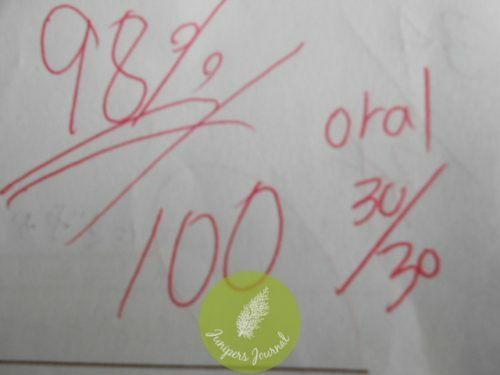 I had scored 98% and this is definitely a score I wouldn’t have expected in my wildest dreams. I had to check the name on the sheet a few times to ensure it was mine. I’ve never thought of myself being in the top student category and so this score came as a complete surprise. I have thoroughly enjoyed the Japanese lessons at Iloha Culture Centre and I highly recommend them to anyone who wishes to take up Japanese.